The ability to produce high-resolution protein structures is a key process in drug design, but it is time-consuming and labor-intensive. The most commonly used method to determine protein structure is X-ray crystallography, but this method only has a 30% success rate. Life scientists and pharmaceutical companies need a way to improve and streamline the process. Prof. Seth Fraden and PhD student researcher Ali S. Aghvami have developed a solution. Both scientists are part of the Brandeis physics department and the Materials Research Science and Engineering program (MRSEC), a program funded by the National Science Foundation. They have developed a microfluidic chip (MFC) that meets these demands. The design uses a cost-effective, bio-compatible material that can be easily altered to meet the customer’s needs. This liquid-handling chip offers a number of key advantages over the current generation of microfluidic chips. The team also successfully completed the Brandeis I-Corps™ program. The I-Corps, or Innovation Corps program, is an NSF-funded opportunity for researchers working on solutions with strong commercial potential to accelerate that commercialization. The program offers entrepreneurship training, mentorship, and a range of other supports for Brandeis researchers preparing an innovation for commercial production. (Brandeis University is one of only four I-Corps sites in Massachusetts). The team eventually went on to the national I-Corps program, a distinct honor reflecting the potential of the technology and innovative strength of the team. 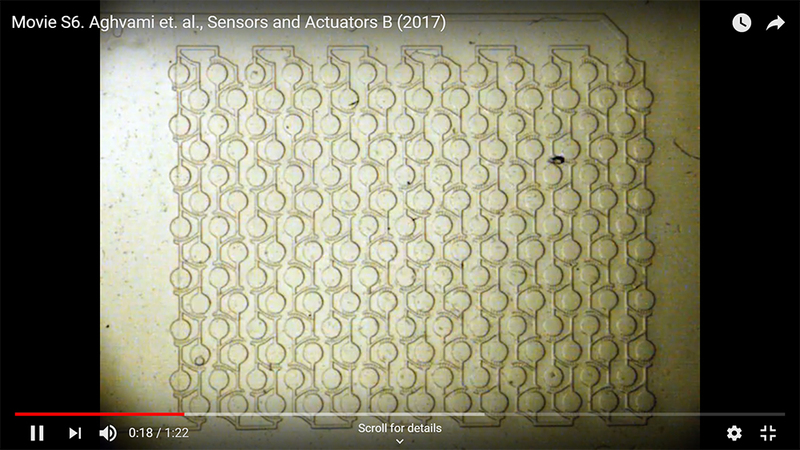 Microfluidics is a powerful liquid handling tool that reduces the amount of solution in screening experiments to nanoliters. It is a technology that has been available to the protein crystallization market for some time, but previous implementations did not meet customers’ needs. Current methods for determining the best concentrations for protein crystallization include robotic mixing of multiple solutions in testing trays and automated scanning for crystals. The MFC addresses this problem in a number of ways. It eliminates costly cryo-protection by using serial diffraction on-chip at room temperature. The MFC is made from x-ray transparent material so that crystals do not have to be removed from the crystallization device. This speeds the process by yielding more protein detail more quickly. It is easier to operate and offers superior performance compared to existing solutions. This innovative solution will reduce the time and cost of determining high-resolution protein structures via x-ray diffraction. The time and cost of determining high-resolution protein structures has long been a major pain point and a production stopper that has plagued the industry for years- greatly increasing the time needed to bring vital new drug products to the market. Fraden and Aghvami’s MFC removes the bottleneck, accelerating the delivery of new life saving drug-based medical interventions. The MFC offers an inexpensive approach to pharmaceutical engineering, which sacrifices none of the critical aspects of determining the molecular structure of a protein. The MFC represents a significant streamlining of the X-ray crystallography process. Protein crystallization remains a challenge as each protein has a unique phase diagram. This means differing conditions should be tested to discover the optimal conditions for crystallization. With this new discovery, Brandeis innovators have broken through a significant barrier in drug development, with the potential to speed the time needed to find cures for a host of diseases.